Car is the only practicable way to reach Egremont (map). The nearest Amtrak train station is at Pittsfield MA. The nearest international airport 52 miles/84 km) is Bradley International Airport in Windsor Locks CT, north of Hartford, but if you don't plan to go to Egremont by car you may find it more convenient to use Boston's Logan International Airport as there are more direct buses and trains from Boston to the Berkshire Hills. 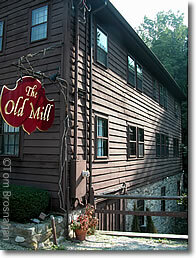 Old Mill Restaurant, Egremont MA.